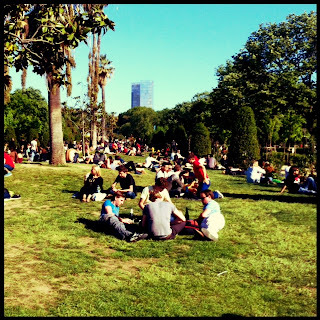 Some people compare the Parc de la Ciutadella to Central Park in New York. I guess they are not thinking about its surface (Central Park is 20 times larger than the Ciutadella) or its origin, but rather about its role in the city. After the War of the Spanish Succession of 1714, Philip V had a citadel built on the area that the park occupies now to dominate the city of Barcelona, ​​and incidentally, all of Catalonia. The building, which also forced the destruction of the Ribera district, became a symbol that was hated by the locals, until its demolition was decided in the nineteenth century, leaving only some of the interior buildings. One of them was the arsenal, which now houses the Parliament of Catalonia. Anyway, what I meant is that the Ciutadella Park is now a meeting place for many locals, that go there for a walk, a picnic or just to spend Sunday afternoons. And...is there anything better than having a nap on the lawn, with the spring sun heating your body? I would not say that the dividing walls are aesthetically what makes us feel more proud of Barcelona. Actually, I guess we would agree that in general they are pretty ugly, but we are so used to them that I think many of us don't even realize they are there when we walk through the city. The are everywhere, in every neighborhood, and in some streets there are not two contiguous buildings with the same number of stores, so all of them have visible dividing walls. Dividing walls are supposed to be shared by two buildings, but many of them are visible, shamelessly displaying some kind of secret, a world that should be hidden. They seem to be waiting for someone to cover them, in a state of permanent provisional nature. The urban development rules make it unlikely or impossible to build the missing heights to cover the walls. Thus, some fractures are created, public spaces despised or even ignored. Similar to what they are doing with the block interiors of the Eixample, the Institute of Urban Landscape of Barcelona is working to restore these walls, and has remodeled more than 100 in the last three years, entrusting graffiti or vertical gardens. Now, would Barcelona be Barcelona without its brick dividing walls, simple and even rough?